Not always, but only when handled carelessly. Shock induced muscle tetany is the most important effect of current on the muscles. If a person touches the energized conductor, fore arm muscles contracts forcefully and fingers bend. So the person involuntarily holds the conductor. Therefore the victim will be unable to take the hand from the conductor. As you know, electricity is the flow of electrons through a conductor from its source to the destination. If the conductor offers less resistance, the flow current will be fast and if the conductor has some resistance, the flow of electrons will be obstructed leading to slow movements which generate heat through friction. Human skin is a semiconductor for electricity and current passes through the body to the ground just like the flow of current through the electric wire. This flow of current causes burning and shock. If the skin resistance is low, the chance of shock hazard is very high. Some people are more sensitive to current while others are less sensitive. Electrical safety measures are necessary while dealing with high voltage AC available from the power grid. Ignorance can lead to a fatal shock or fire hazards. Remember, Electricity travels at the speed of light. Its flow is around 299,460 kilo meters per second so you will not get time to react because you can’t move faster than electricity. So the best way is staying out of its way. The Credit Card and ATM card is a kind of payment card issued by the Bank to the customers as a system of payment. The card allows the card holder to pay for the goods purchased as well as to withdraw money from ATM (Automated Teller Machine) counters. The Credit card is popularly called as Plastic money and is different from a Charge card. The Charge card requires the balance to be paid in full each month while the Credit cards allow the users a continuing balance of debt subject to the interest being charged. ATM card on the other hand is issued by the bank for the account holders to withdraw money from ATM counters without going to the bank. Unlike Debit and Credit cards, the ATM card requires authentication through a Personal Identification Number or PIN. Some banks provide a combined ATM and Debit card called Bank card for easy use in ATM counter as well in Point Of Sale (POS) transactions. Optical Mark Recognition (OMR) is the technique used to scan a marked paper to detect the presence or absence of the mark in a predetermined position. The OMR reader illuminates a beam of strong light onto the paper for recognizing the marks. The contrasting reflectivity at the predetermined positions is then utilized to detect the marked positions on the paper. The marked areas reflect less light compared to the blank or unmarked areas. If the darkening of bubbles is not perfect or incomplete, the Reader fails to identify the marks and leave the areas as unmarked. The most important use of OMR is the detection of pencil marked bubbles in optical answer sheets used in Multiple Choice Question (MCQ) examinations. The personal information of the candidate is marked in the data part of the OMR by darkening the appropriate circles. Similarly the answers are also marked by bubbling the suitable circles in the preprinted answer sheet. The OMR reader scans the answer sheet to recover the data and answers. The answer sheets are then graded automatically by the OMR reader. Even if you mark the correct position, if the marking is incomplete, you will not get the score due to error reading. Because it uses Optically Variable Ink or OVI as an Anti counterfeiting measure.OVI is considered as the most complicated type of ink to prevent forgery of documents. The ink has a colourful metal luster with two colours. Various combinations of colours are Red-Green, Gold-Silver, Green-Blue combinations. When viewed under sunlight, the ink gives two colours with optical variation and sharp colour change. Due to its complicated ink production procedure, huge investment, high anti-forgery reliability, it has become an excellent anti-forgery ink. Moreover, the ink is highly resistant to environmental factors such as sunlight, moisture etc. Depending on the angle of incidence of light, the OVI reflects different wavelengths of white light. As a result, a colour change feels when viewed with unaided eye. If the document is copied using a scanner, only one colour will appear in the image so that it is easy to check the documents with the original one.The OVI is highly useful to show the authenticity of the documents since the use of the ink is strictly controlled and not available easily. Simple but less use. A tricky person can do anything because there are many free software to remove all the markings even the digital marking on the image. But if we give protection mark, majority will think twice before going to do the trick. Majority of people are using the images in facebook and blogs after downloading from other websites. But most of the people are aware about the copy right rules and they do not use the image if there is a copy right symbol. If you use the photo of a scenery or gadget, it will not harm much but it is serious if you use an artistic work, graphic designs or rare image without permission. 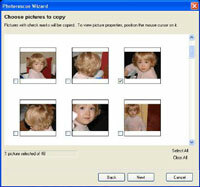 Some images are free downloadable sharing images and you can use such images indicating the source. But close watch the images containing the statement or other indications showing protection. Down load and use the image only after getting permission from the author. Some images are simple without any copy right and the authors will not have any objection to use it in other websites. Image theft is the unauthorized copying and use of Images and Photographs from documents including the electronic media. Some people are deliberately ignoring this matter and simply downloading,and using the images in their websites or blogs without seeking the permission of the author. How to solve these problems? Here are some tips to protect your images even though it will not give sufficient protection since a tricky person can do many things.